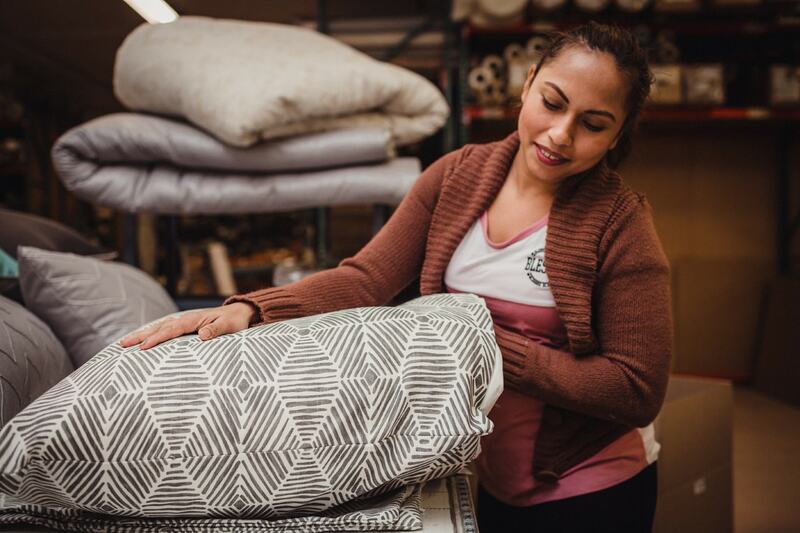 At Eastern Accents, we are experts in American-made luxury home textiles and we seriously love all things soft and beautiful. 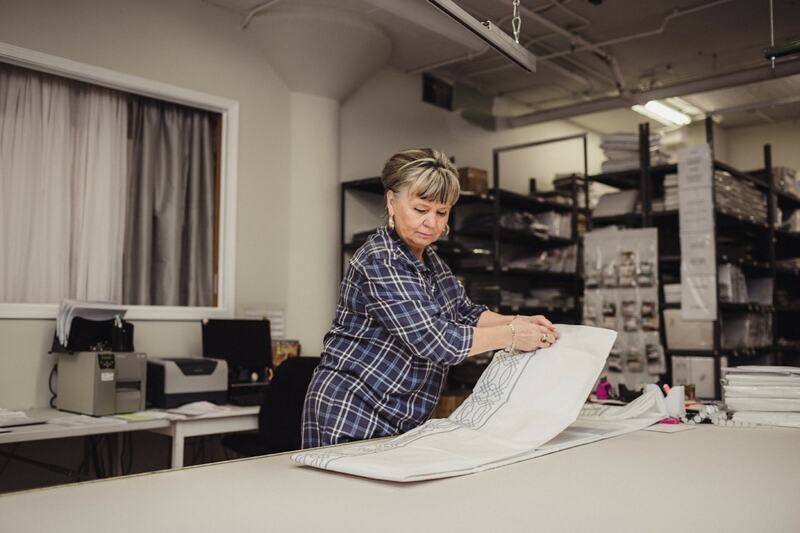 Founded by a husband-wife team in 1989, we remain a family business with the same dedicated focus on trend-leading design, unmatched quality, and fantastic customer service. 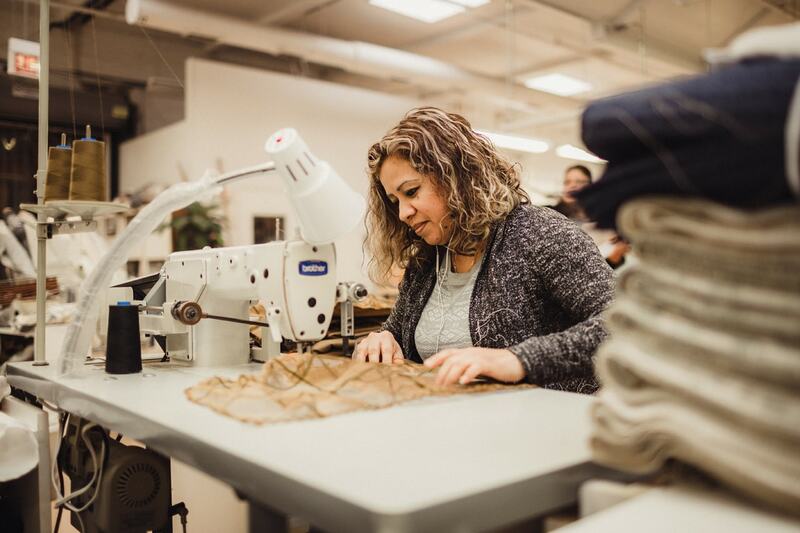 Based in the heart of Chicago, we are proud to have kept all of our departments (including manufacturing) under one Windy City roof. 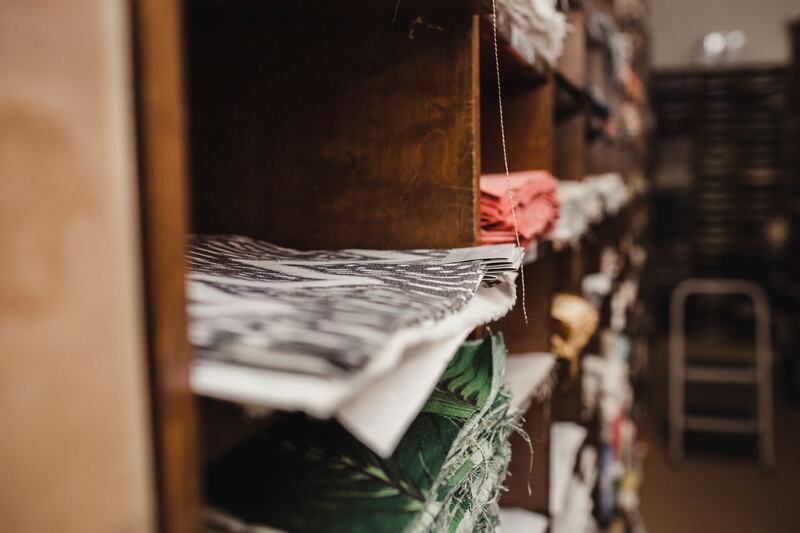 Our in-house design team travels the world getting inspiration and selecting the world’s finest fabrics, translating them into unique new looks to last a lifetime. 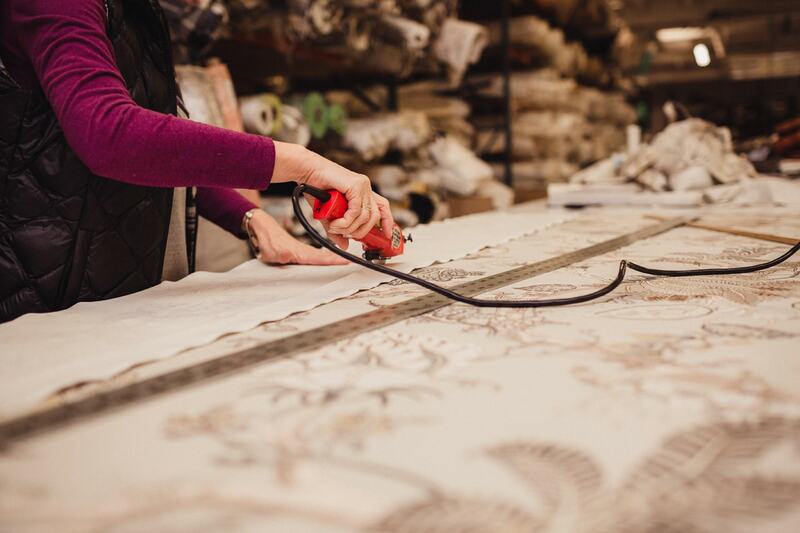 Our skilled team of in-house craftspeople make all of our products to order, giving us full control of the production process and quality control. 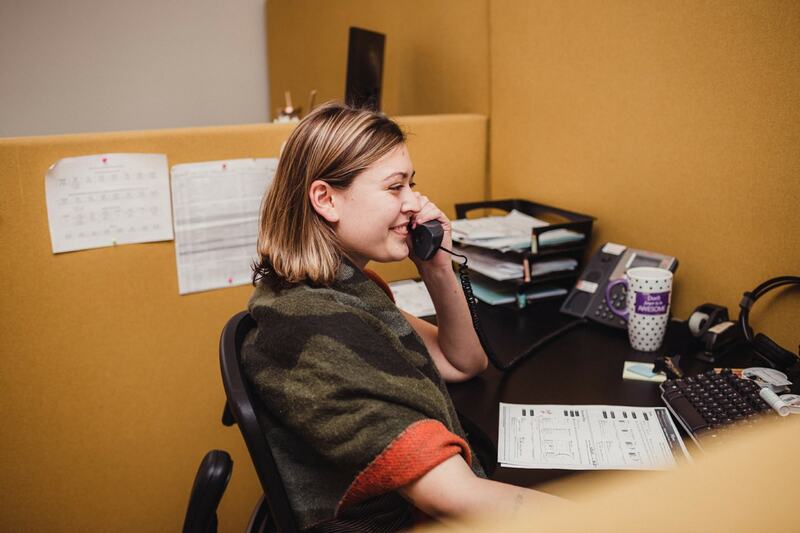 And finally, our customer service team is well-versed in every sewn-up, quilted, and embroidered detail we could think of - and located right here, so they're involved in all areas of our business every day. 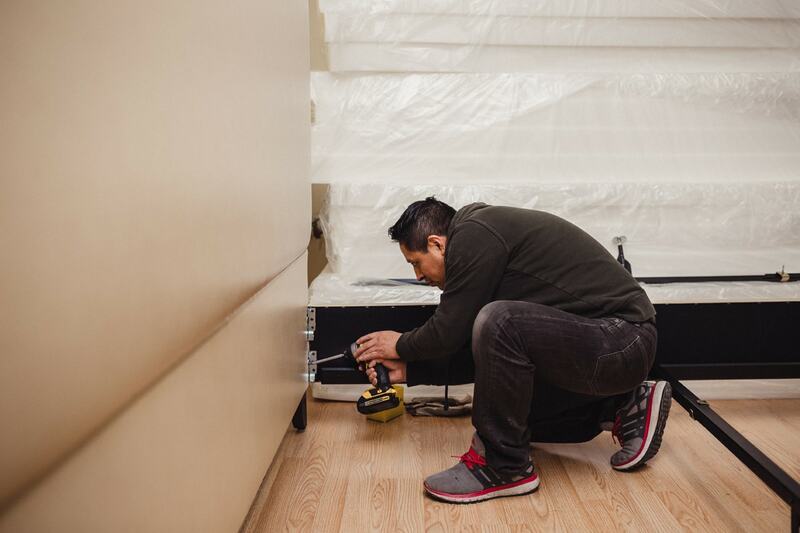 Eastern Accents is still a family business made up of a team of dedicated Chicagoans. 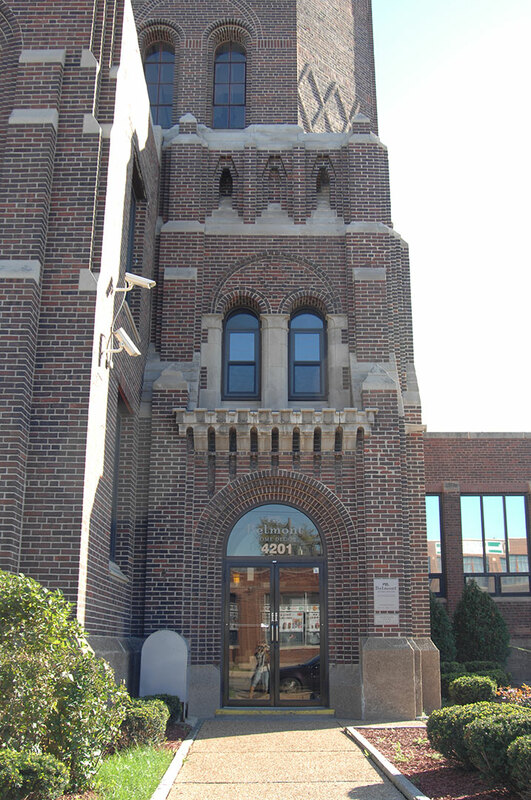 Many of us live in the streets surrounding our facility, the last of its kind within Chicago city limits, and we are very proud of our company’s warm community spirit. We would all like to thank you for thinking of us; we hope we can make you soft and beautiful things for many years to come. Welcome to our factory! 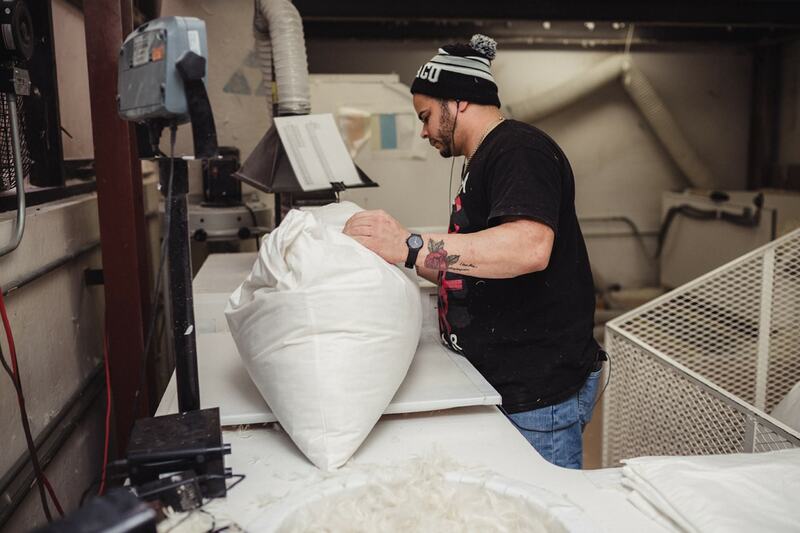 Originally built for radio manufacture in the 1920s, this central Chicago building is now where all of our luxurious bedding is made. 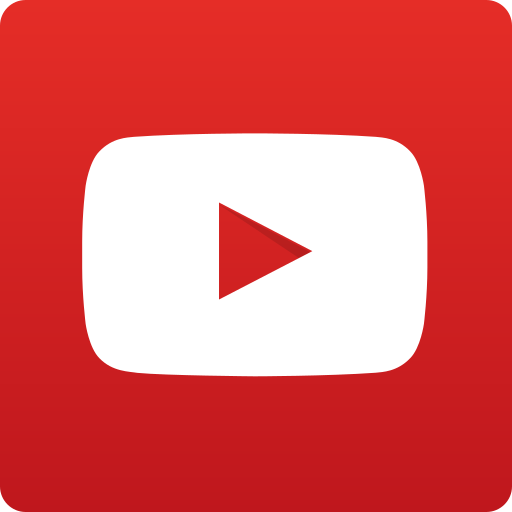 Let us take you on a tour inside! 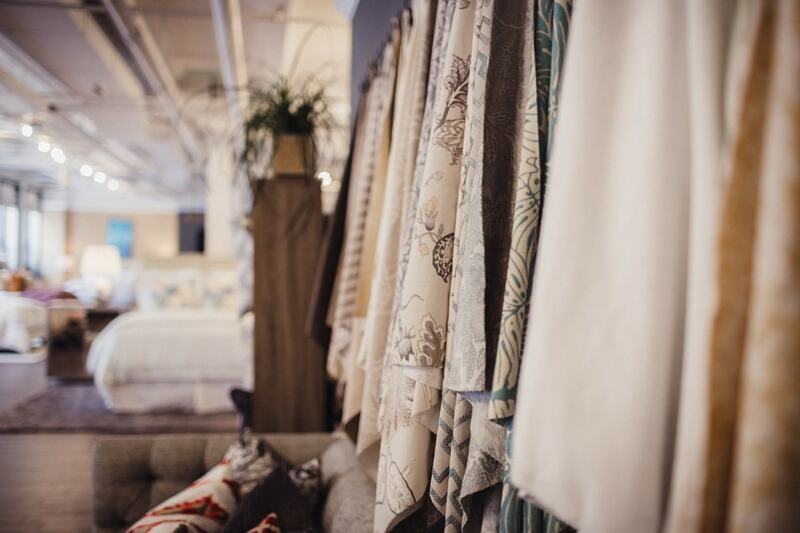 The first room you'll enter will be our showroom - open to the public all work days - where you can browse our latest collections and even shop our retail offerings. Our showroom is also home to a meeting and design space, complete with trim samples and product binders. On the far right hand of our premises, our Design Department is where everything begins. 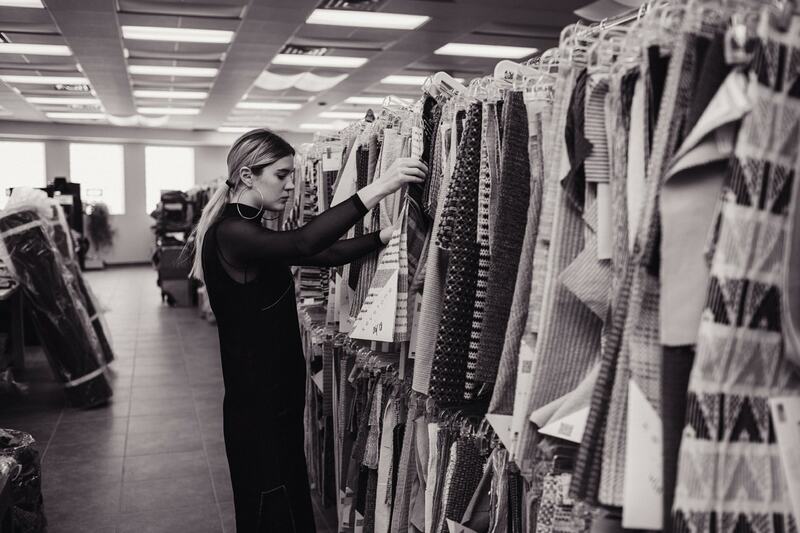 Our super-talented team of textile designers source the best materials from around the world to put together 10-15 trend-setting new collections twice a year. Each new collection goes through several rounds of development, including discussions between design, sales, production, and marketing teams. 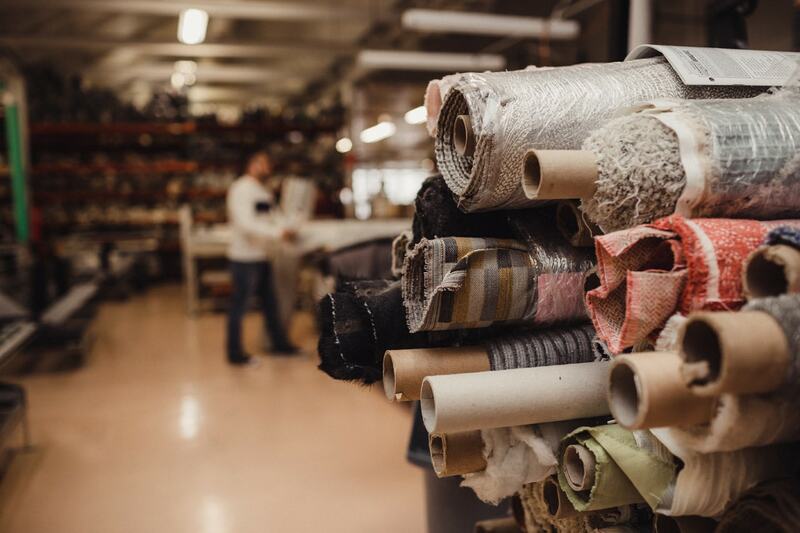 Our designers source sample materials from the best fabric mills all around the world. This fabric "library" is where product development begins. 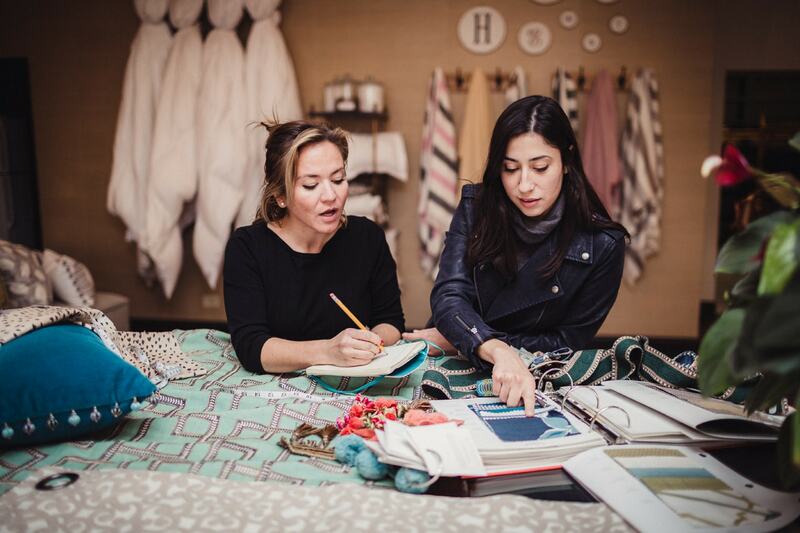 Designers consider how a fabric's quality, weight, texture, and coloring coordinate with each other, our current offerings, and the very latest in textile and fashion trends. 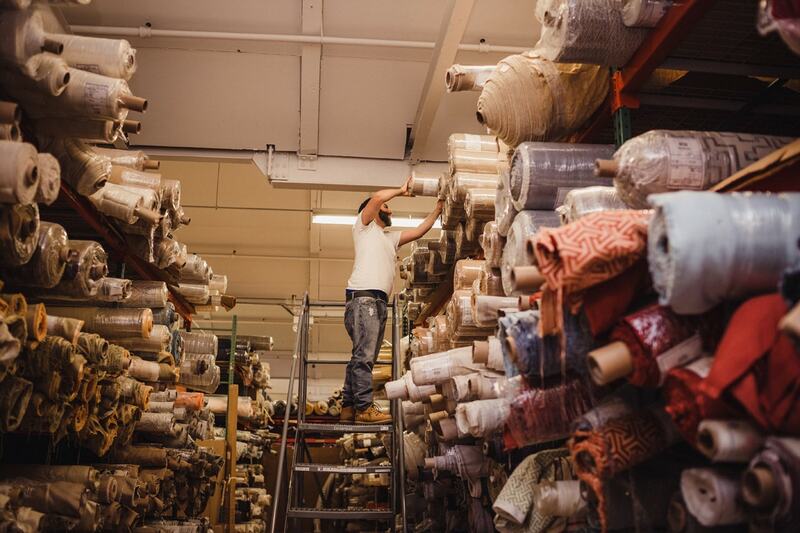 It looks complicated, but our fabrics are carefully organized and coded by aisle, shelf, and unit. 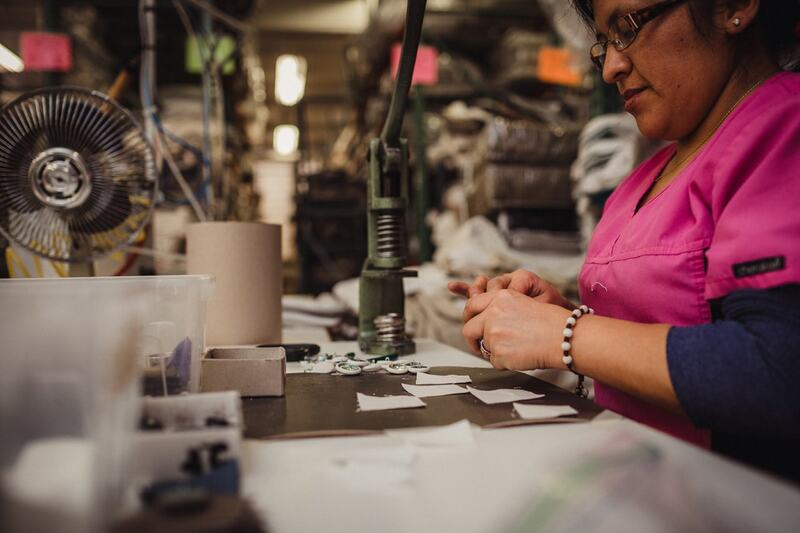 Our extensive zipper inventory includes every size, color, and style we could think of to perfectly match our products. 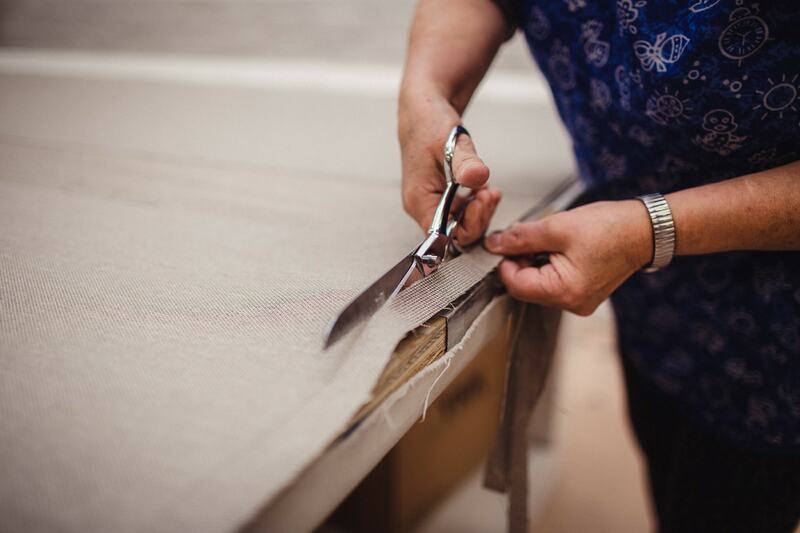 Each bolt of fabric is carefully inspected on arrival, then wrapped and secured in plastic to keep it safe from dust. A select few items are just too popular to make to order; our Quickship selection is a group of 15 collections that we keep in inventory for extra-fast lead times. Right next to Inventory is our Cutting department. 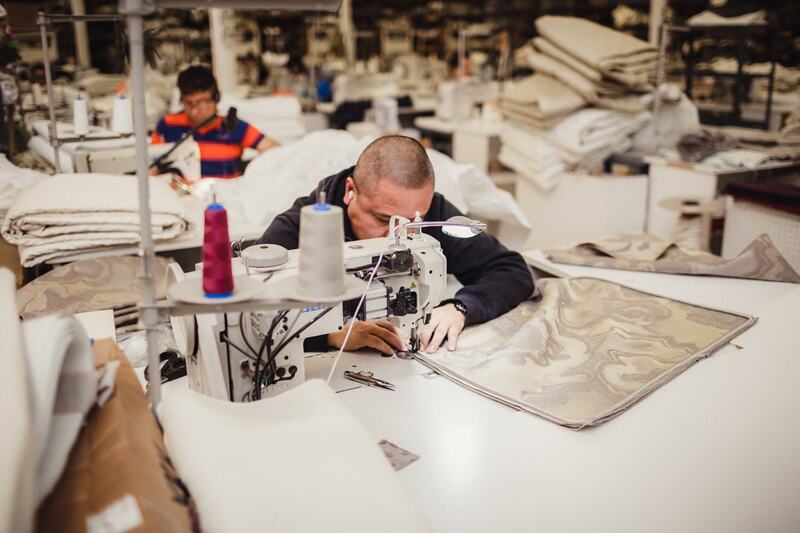 Since over 90% of our product is made to order, the Cutting department is probably the first place your order goes. 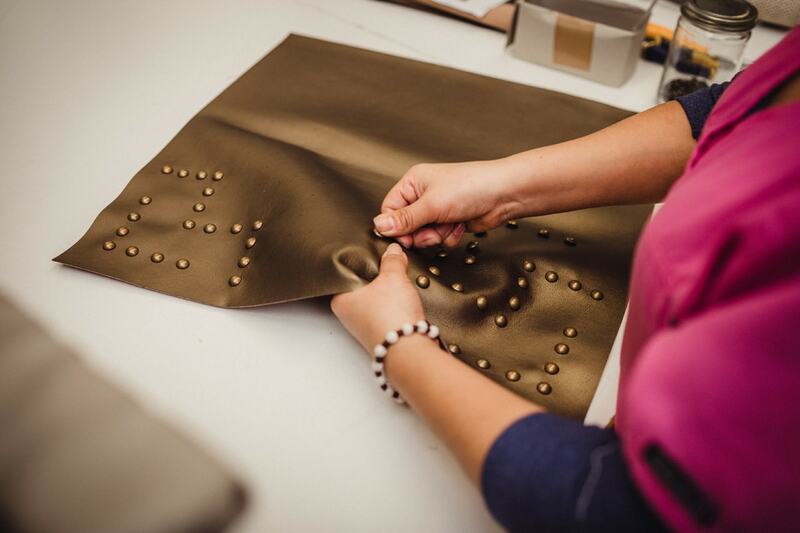 Following a detailed product spec, our Cutters pull fabrics from our extensive inventory and follow complex cutting patterns. 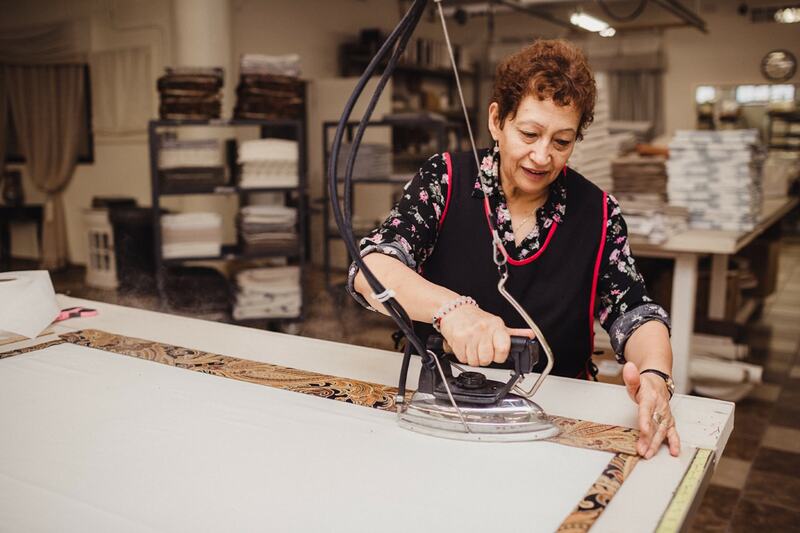 Our team of skilled fabric cutters are trained in cutting many delicate and intricately patterned fabrics by hand to avoid damage or inconsistencies. 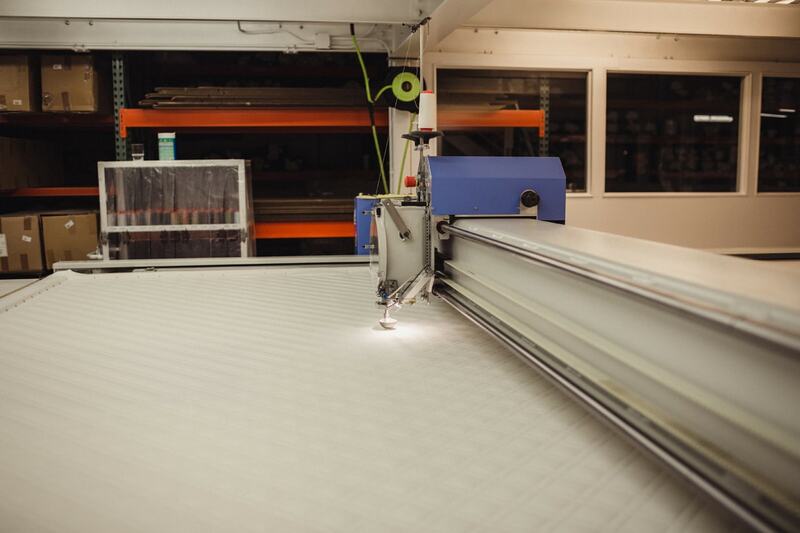 Our cutters are incredibly precise, and use specialty scissors, tables, and other equiptment to get the job done right. We also make Customer's Own Materials (COM) custom projects, using fabrics sent in by you! 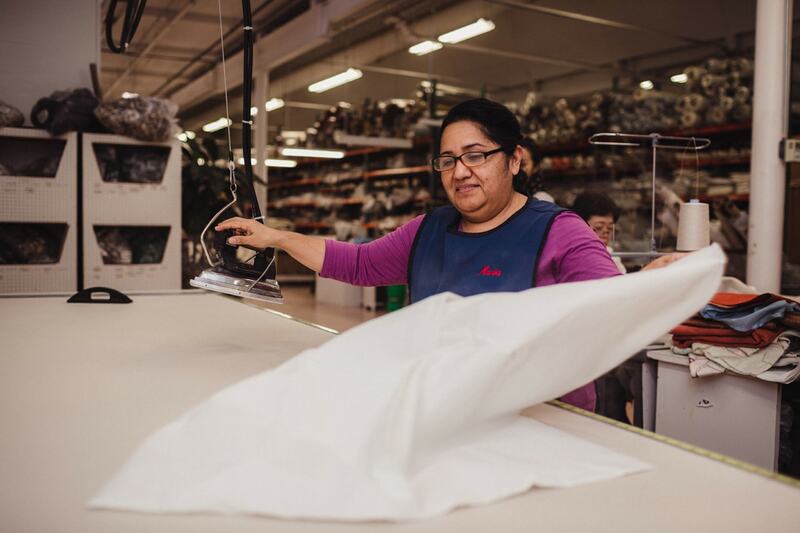 Less complicated fabrics can be cut by our laser machines, which are programmed to minimize fabric waste. 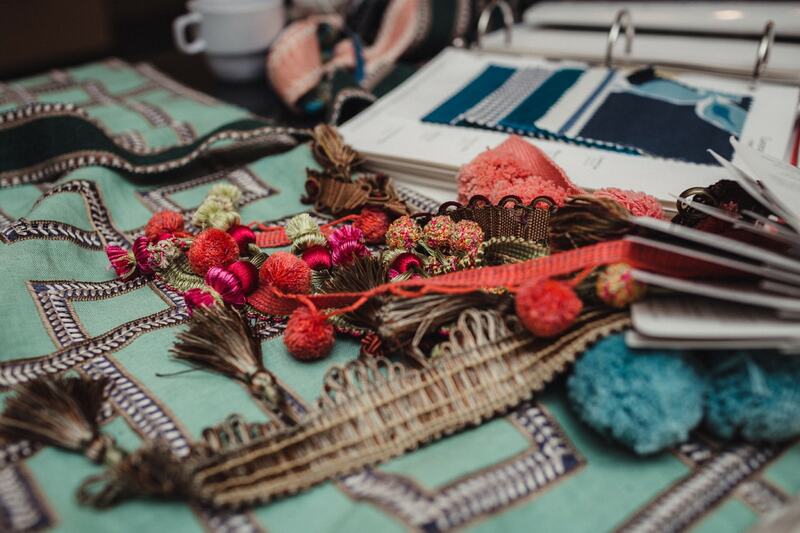 On the other side of the floor, skilled hand-painters, nailhead-appliers, button-makers, and tassel-spinners make beautiful embellishments. 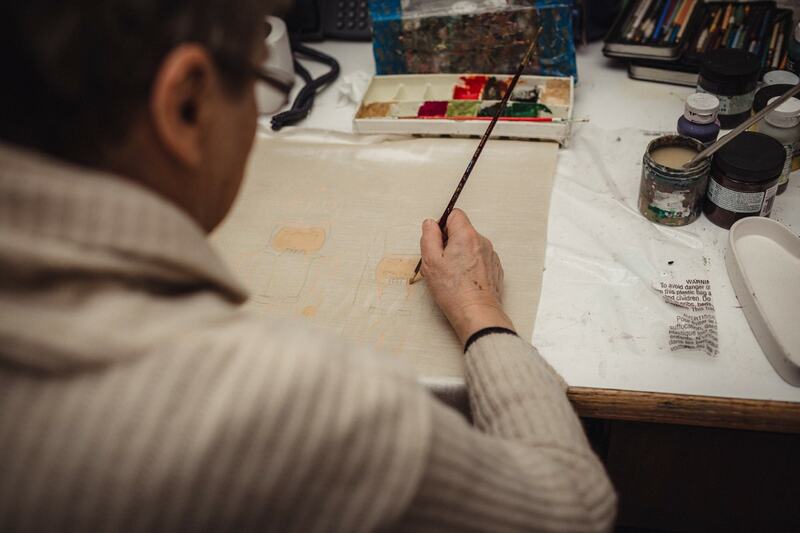 Our incredibly skilled hand-painters create beautifully decorated pieces and work with our designers to create new products. 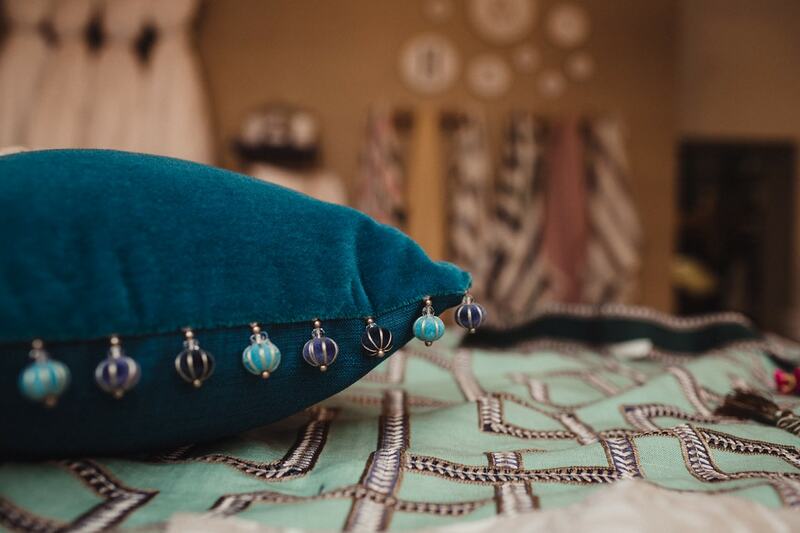 Metal nailheads give our decorative pillows, duvet covers, and upholstered furniture a glam edge. 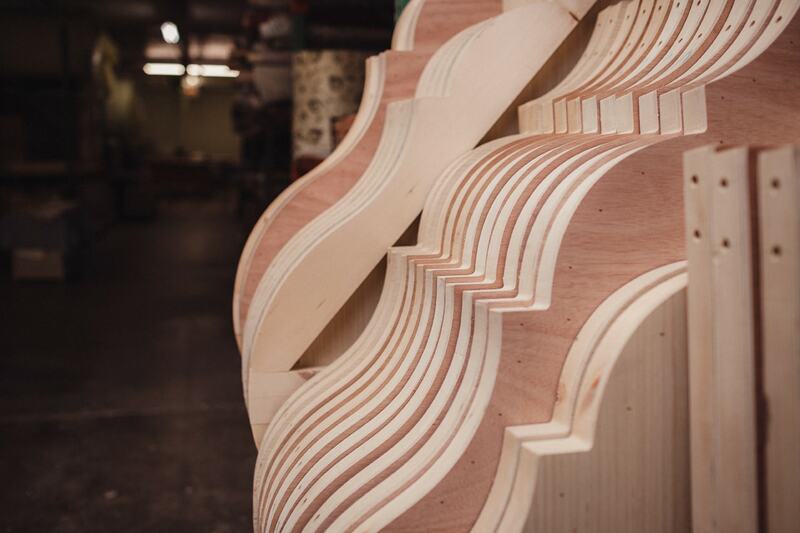 All are applied by hand in complex patterns. This device creates fabric-covered buttons, ensuring that buttons on all products match the rest of the item. 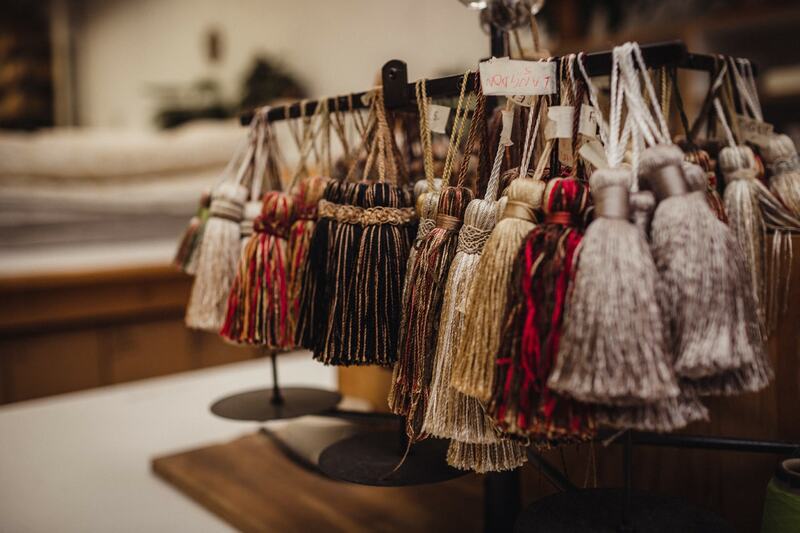 Tassels, tassels, everywhere! Classic, glamorous, and fun, they decorate everything from curtain tie-backs to decorative pillow corners. 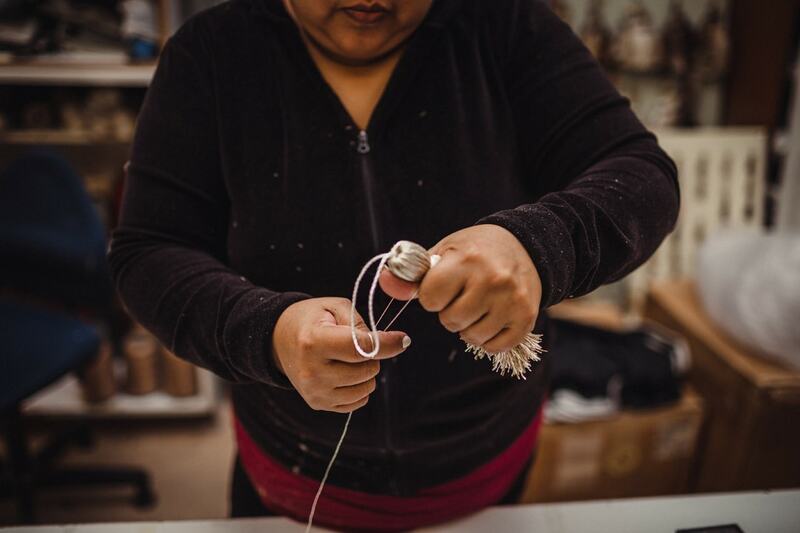 All of our tassels our handmade using this traditional pedal-powered tassel spinner. 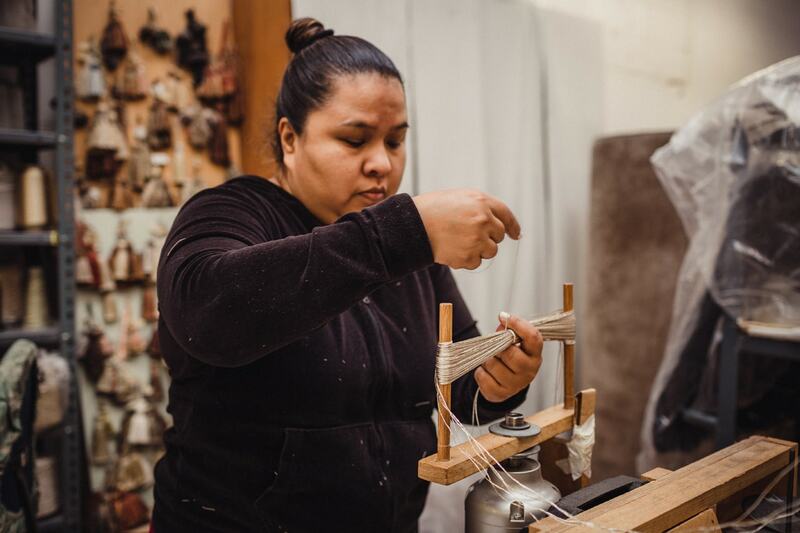 With the threads spun, our tassel maker cuts the threads, folds them over, and ties them together. The finished product is a beautiful decorative tassel, ready to be attached. 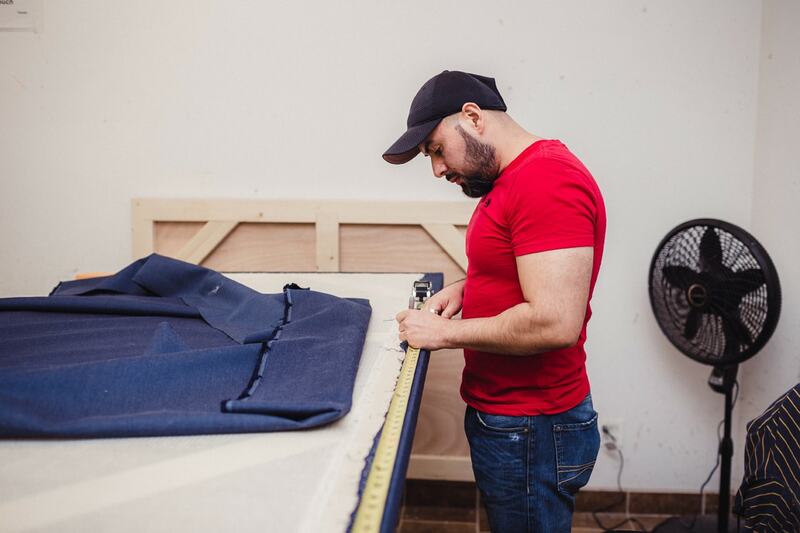 Just one Zipper Shelf away from our Cutting Department, you'll discover Sewing. 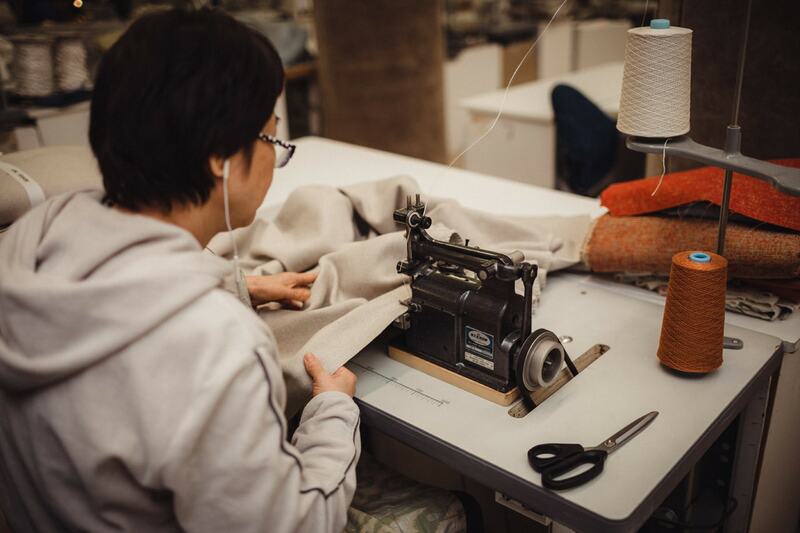 After the fabric is cut and decorated with any special buttons, piecing, painting, or embroidery, your order heads over to the Sewing Department to be put together. 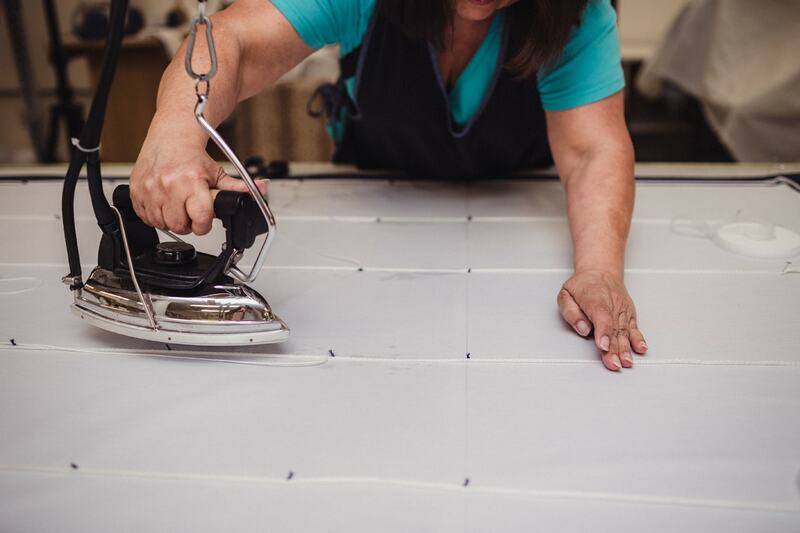 Our highly skilled seamstresses sew at unbelievable, super-fast speeds, all while working with special delicate fabrics. 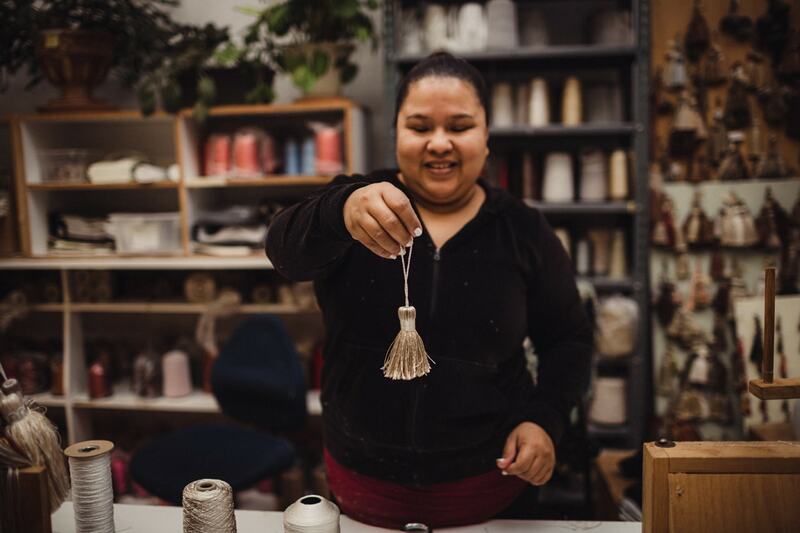 Kelly, one of Eastern Accents' very first employees, works her magic in the sewing room. 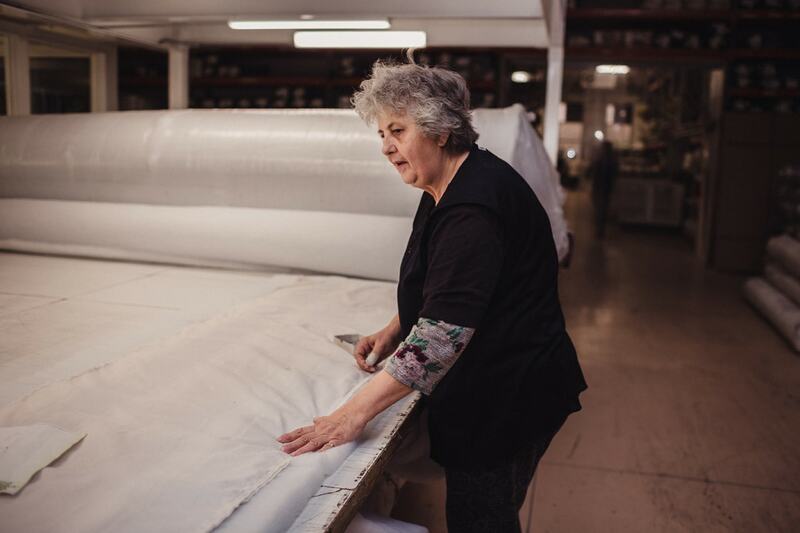 Our last stop in this room, right at the back of the sewing area: Fine linens (the especially luxurious cotton and linen fabrics we use for sheeting) get special treatment. 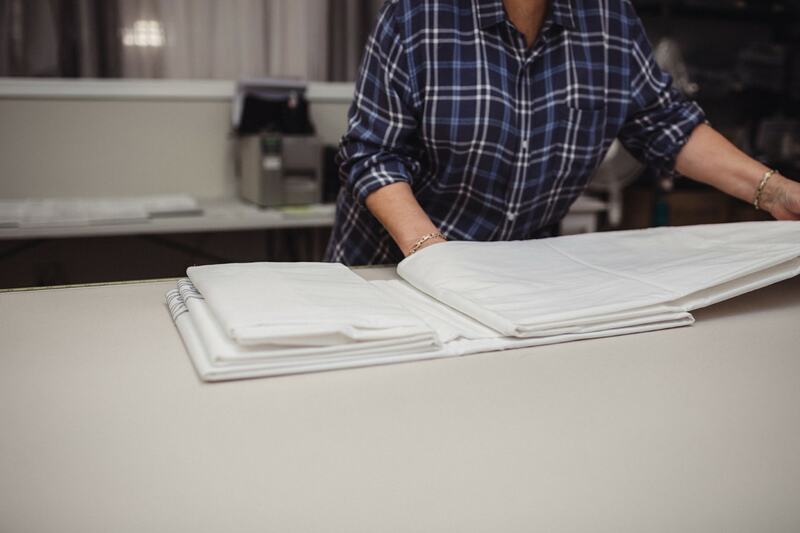 They are cut, sewn, ironed, and folded by a dedicated fine linens team. Fine linens include high-thread count 100% linen, 100% Egyptian cotton percale, and 100% Egyptian cotton sateen sheeting. Our linens also feature skilled edge embroidery, lace piecing, and more. We use special high-quality irons, suspended from the ceiling, to meticulously iron each fine linens item, such as this duvet cover. That way it is crisp, clean, and perfect when it comes to you. 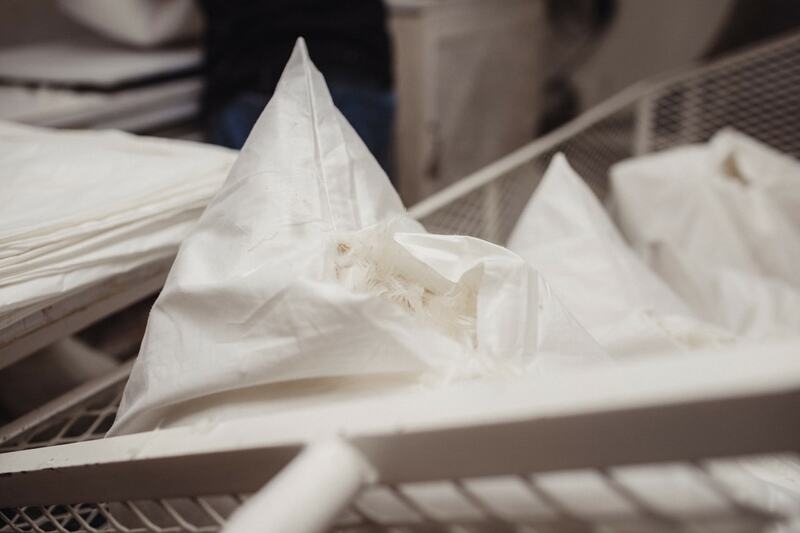 Folding is an important part of the Fine Linens production process. These large sheets, duvet covers, and pillow cases are expertly packed for superior customer experience. Phew! We're a primarily open-plan space, so now we're only entering Room Two of production. 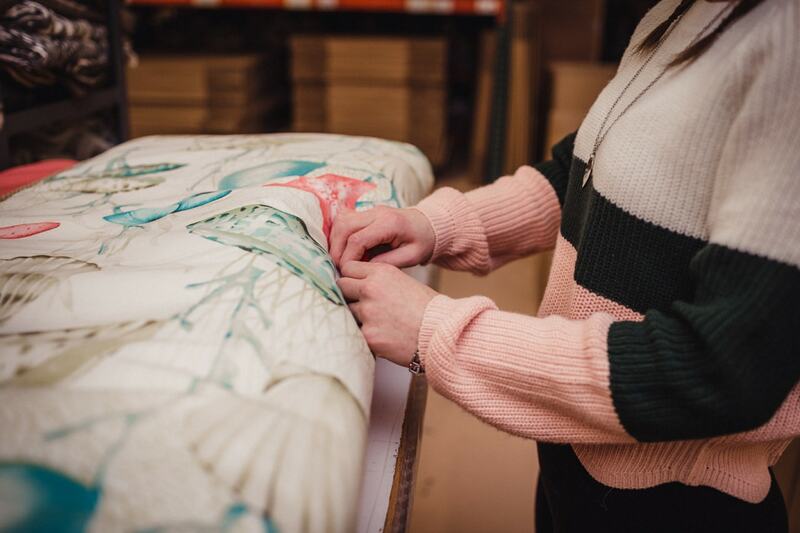 This state-of-the-art quilting machine allows us to make our own quilted products, fastening a layer of high-quality batting between two layers of decorative fabric in unique patterns. Right next to quilting, our batting table works on fastening batting in comforters, bed scarves, and other padded items. Batting is cut to perfectly fit between two cut fabrics,and is then fastend by hand-tacking or button-tufting. Button-tufters hand-sew decorative buttons along the comforter to keep the batting perfectly in place for years to come. In the last room, all the way at the back of our factory, we have saved the most important part for last: our Down Room. 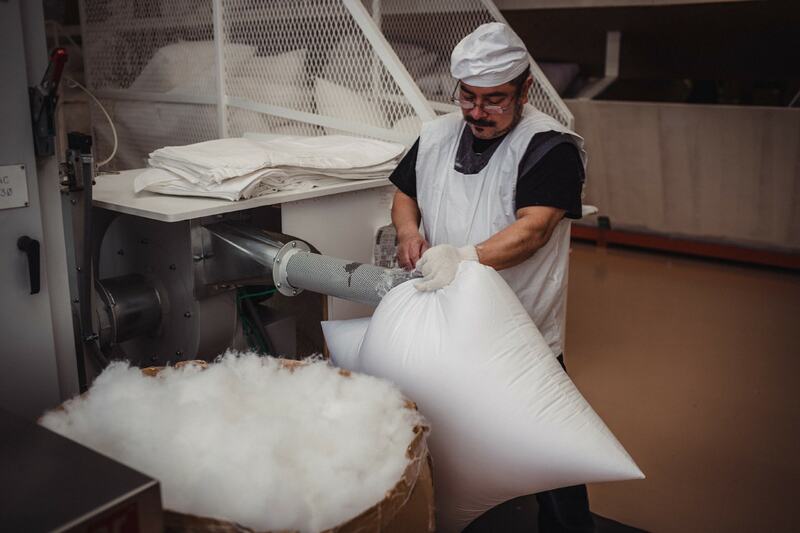 To ensure each of our products from pillows to duvets is filled with the very best down or faux down forms, we make our own. We even designed our own Down Room machinery (the rest wasn't good enough!) and got it manufactured to perfectly suit our needs. 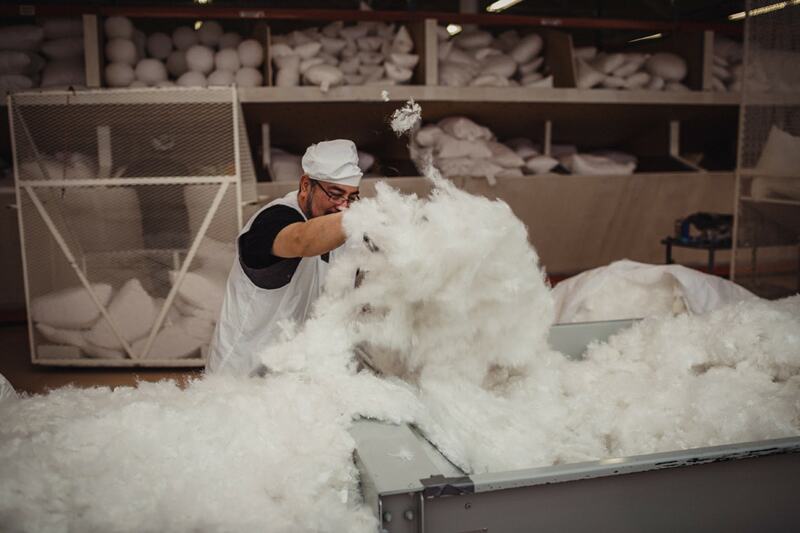 This custom-made down spinner keeps the feathers moving, keeping them soft and fluffy, as the delicate fibers can become crushed if left in storage for too long. And it's not just down. We also make all of our own high-quality feather, blend, and faux down inserts. 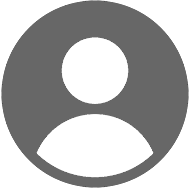 Each of our fill types are sourced from some of the world's highest-quality vendors. Onced an item is filled, it is weighed on an extremely sensitive scale to make sure the correct amount of fill was used. One floor down you'll discover drapery and furniture. 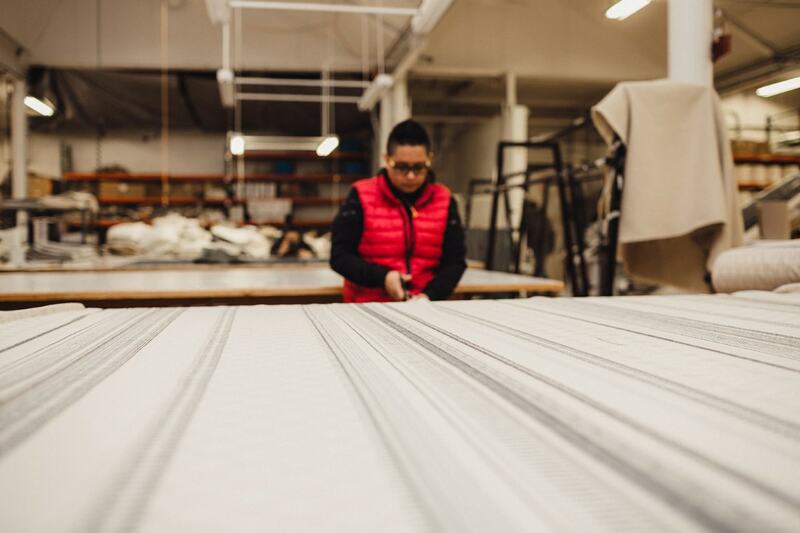 All curtains are meticulously ironed, inspected, and tested to make sure they have a perfect even drape. 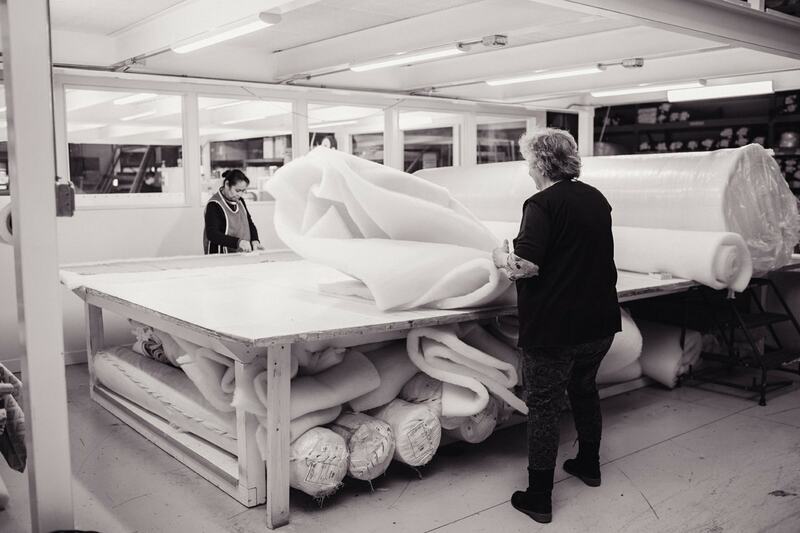 Our state-of-the-art drapery room includes special large-scale tables that enable us to make custom pieces of even the most extraordinary sizes. Here, one of our drapery masters has hand-tacked the string to a set of Roman shades and is ironing out her work. 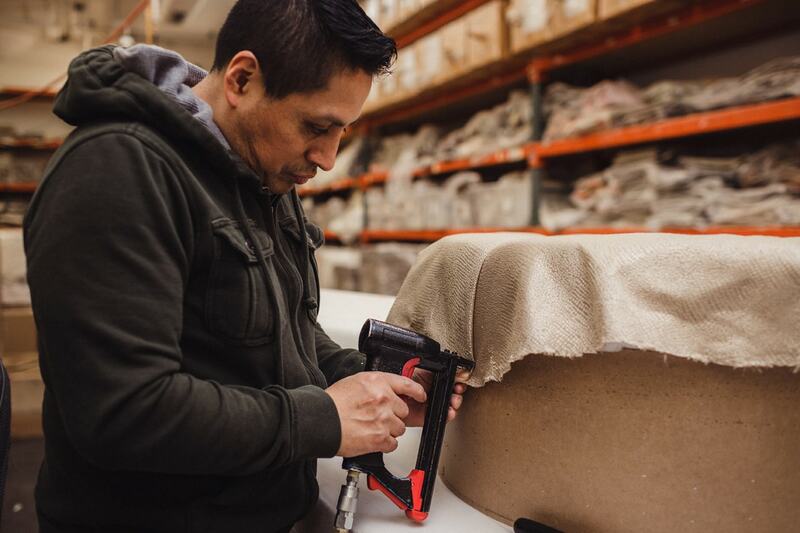 Our Online Upholstery Workshop enables customers to choose one of our unique fabric designs, apply their own fabrics, and view a mock-up immediately online. 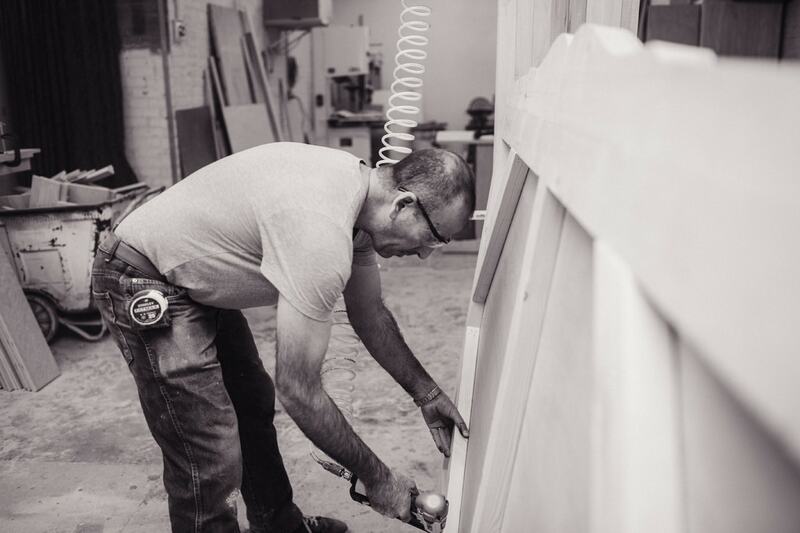 All furniture pieces are benchmade in our factory by skilled carpenters. 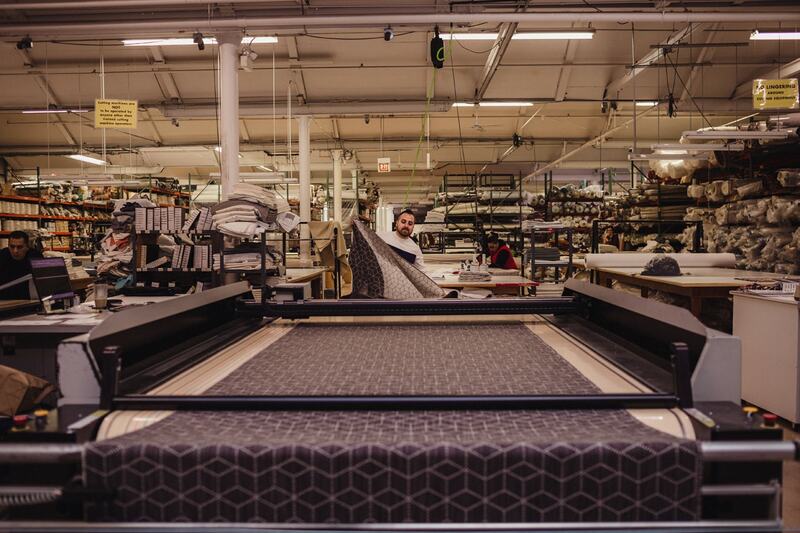 As with most of our work, the development of our upholstery workshop was a collaboration. Our designers and carpenters came together to create beautiful and versatile styles that would suit our range of fabrics. 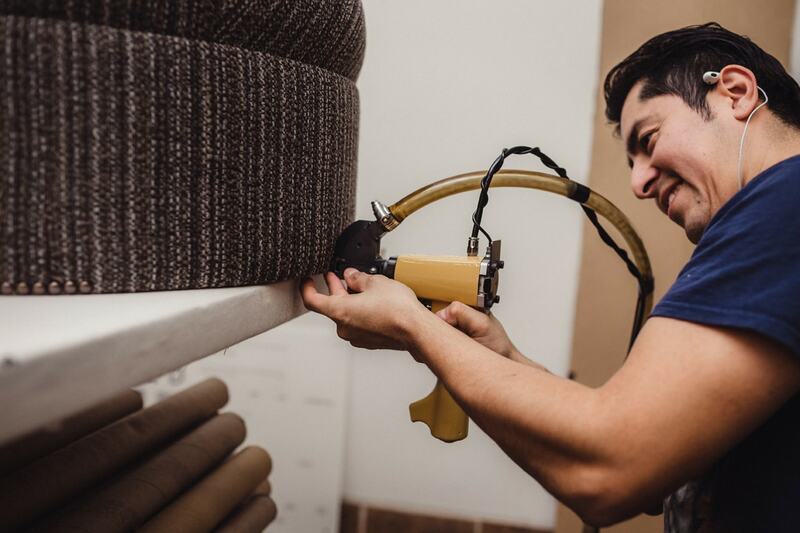 Our upholsterers line each piece with high-quality upholstery batting, then stitch your chosen fabric in place and apply any optional decorative features, such as button-tufting or nailhead detailing. Skilled craftspeople also embellish your custom upholstered furniture with nailheads in a variety of styles and designs. We use matching strips of fabric to conveniently hide any nails, stitches, staples, or other signs of construction seamlessly. Our standard and semi-custom upholstered furniture offerings include headboards, beds, benches, ottomans, stools, benches, and daybeds. 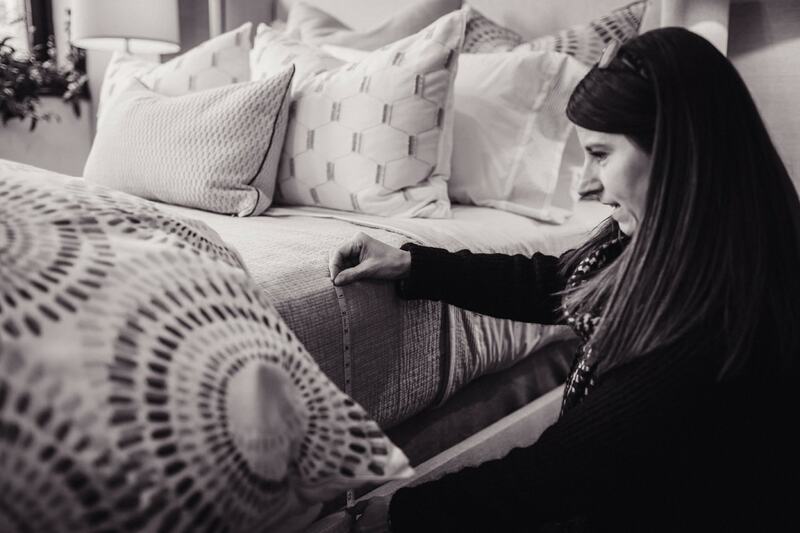 Each handmade bed is carefully constructed to be easy to put together at home simply slot in the headboard and your bed is ready! No professional assistance required. 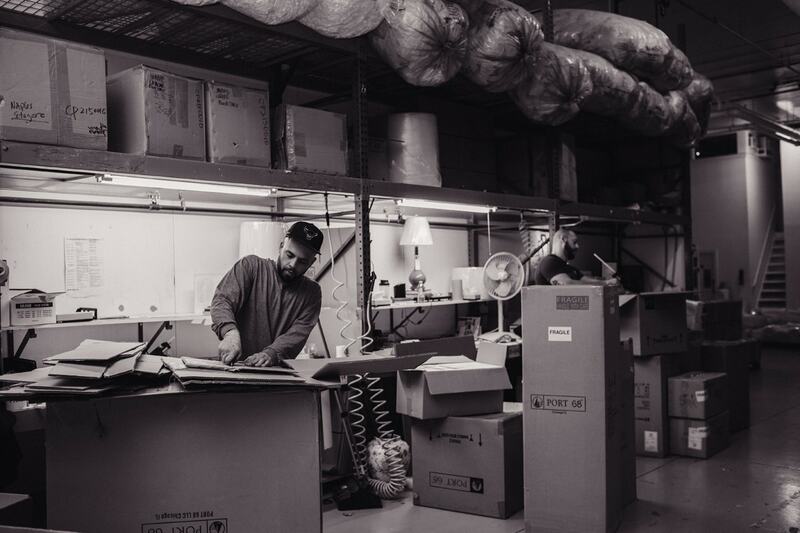 Our packers take great care to stuff, fold, and package your order so you get a perfect finished product as soon as you open the box. 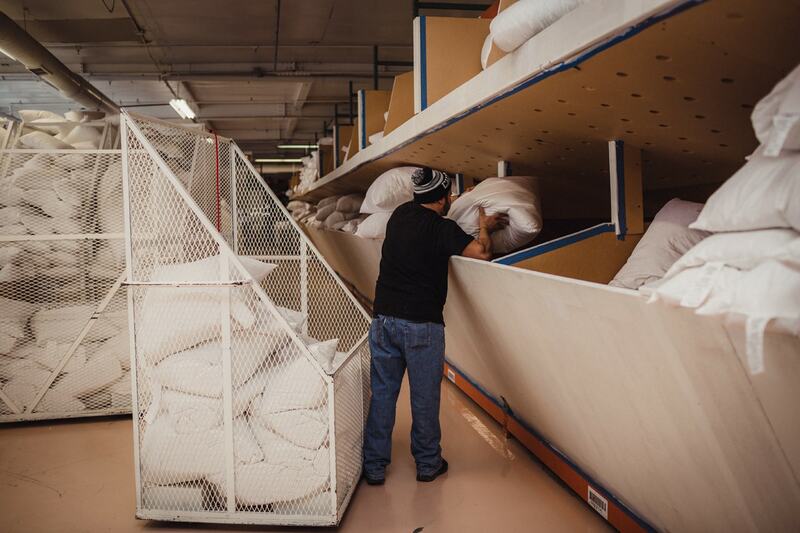 Just a shelving unit away, our packers and pillow insert makers communicate every day to ensure you get your finished product as quickly as possible. 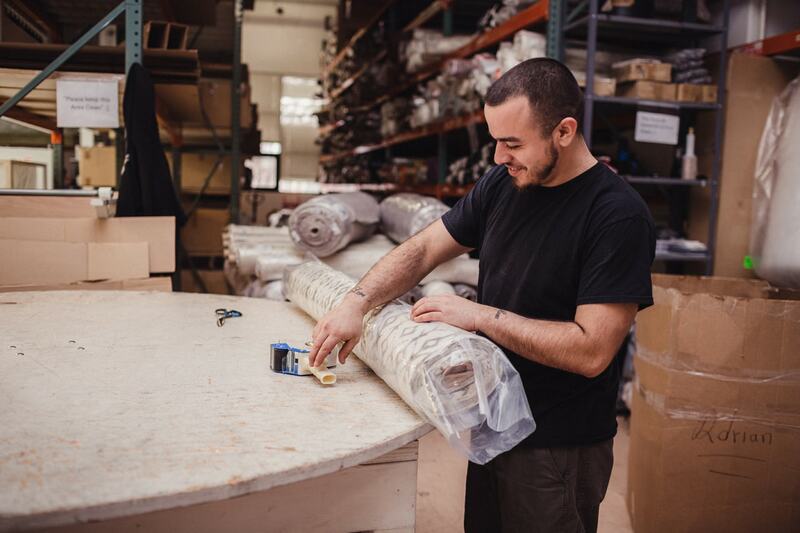 The Dock sees each project at its very beginning and very end: receiving and delivering fabrics and shipping out your order when it's ready. 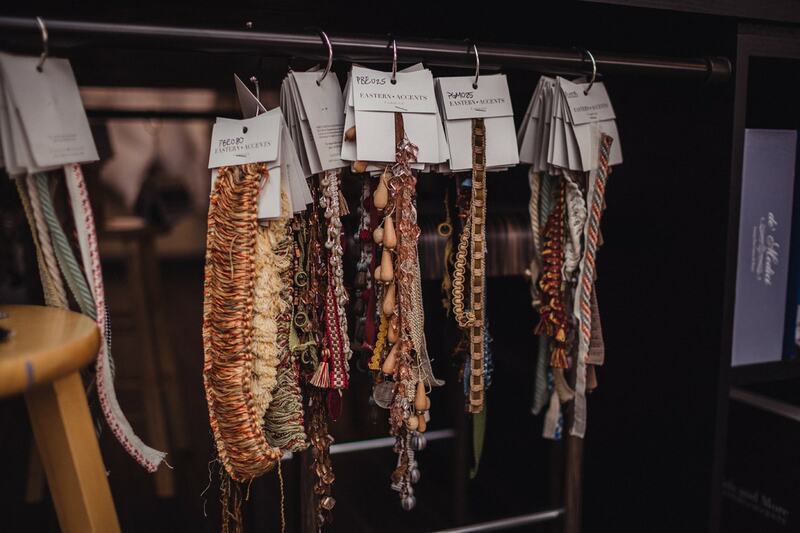 Our fabrics, trims, and other materials our sourced from some of the most innovative and highest-quality vendors. 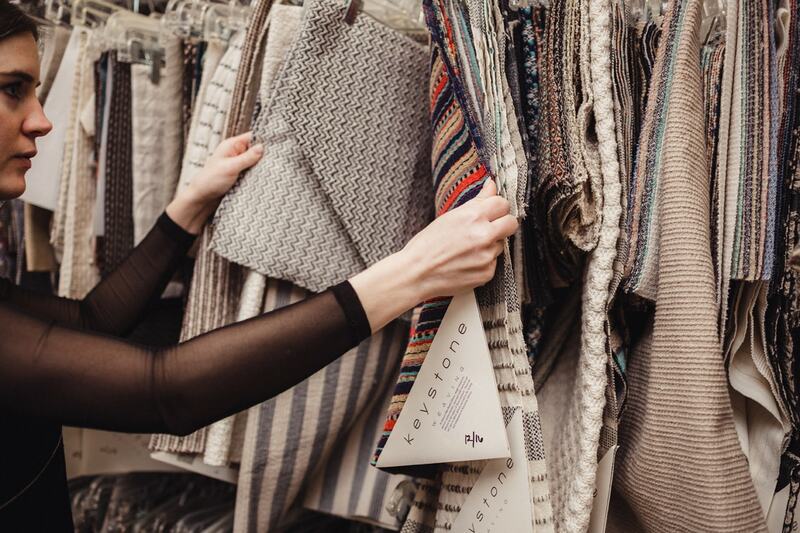 Our design team travels the world discovering new mills, exploring trend-leading trade shows, and keeping an eye out for the latest great textiles. Next door to our Design department is our photoraphy studio, home of our Graphics team. Here we photograph, lay out, and write copy for all of our own catalogs and marketing materials. 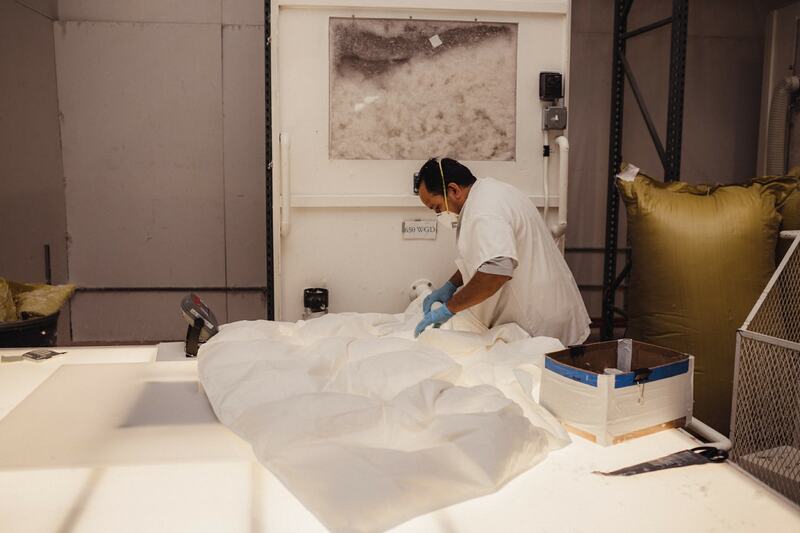 Dating back to 1908, this large open part of our premises was originally built for making bagged ice. 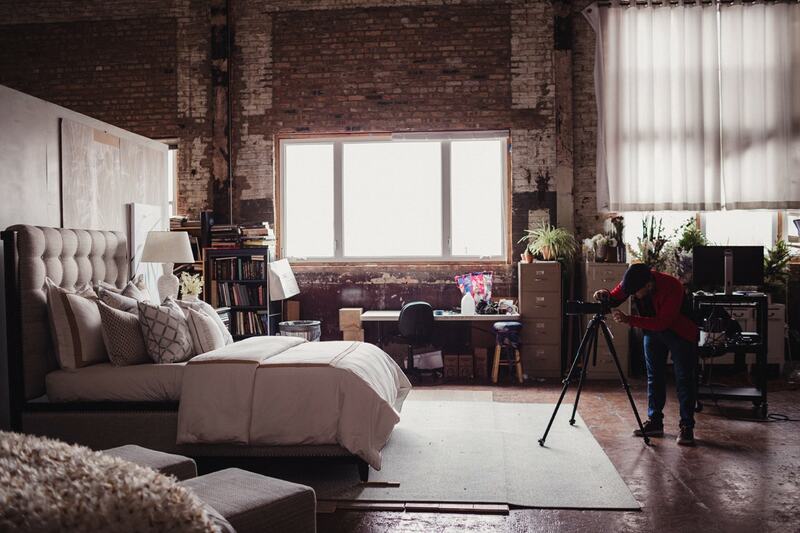 Luckily it also doubles as a wonderfully-lit photo studio. Loop back round to our showroom and you'll pass through our Swatch Room - where we make all of our own swatches. Swatches are attached to cards which customers can order on their own or within a large Deluxe Binder, a treasure trove of Eastern Accents product information including descriptions, details, and swatches on each collection. 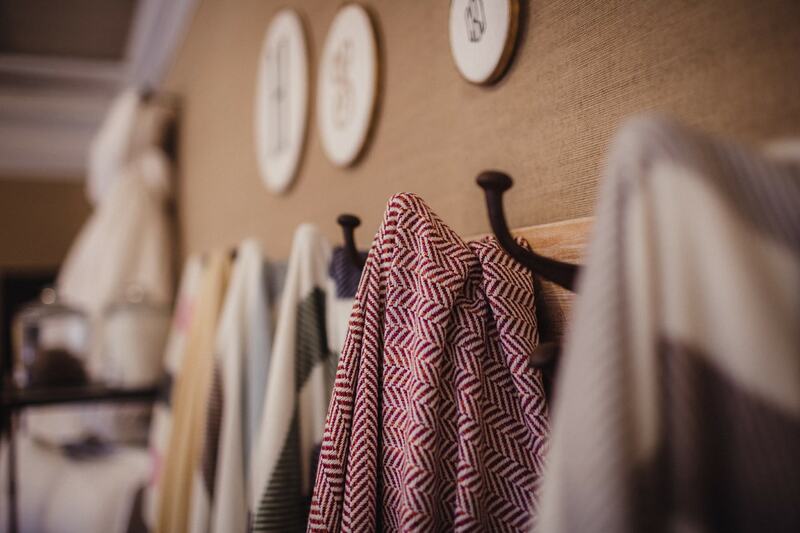 And here's what our product looks like when it comes to you: simply well-made, well-designed home accessories. 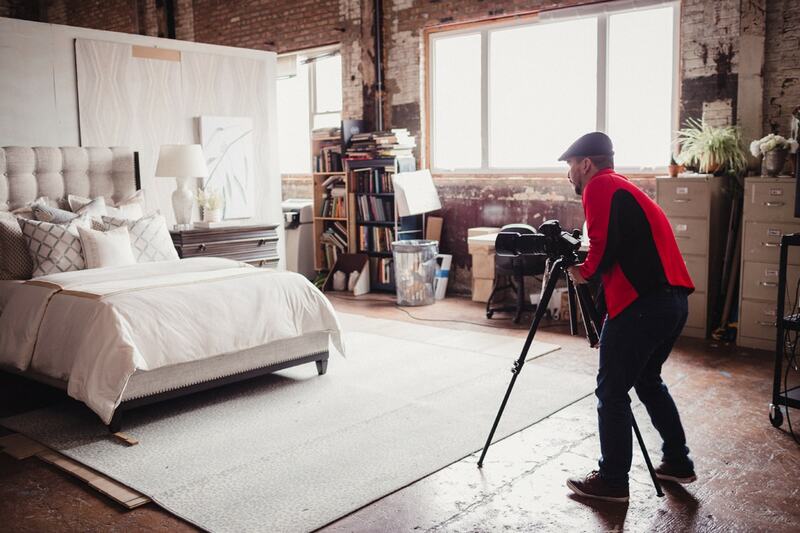 Our line includes licensed brands from three interior designers: Barclay Butera, Thom Filicia, and Celerie Kemble. Each brings their own unique flair to our offerings. 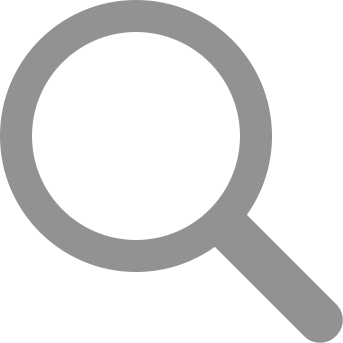 We can also provide sample swatches, binders, catalogs, and more sales materials; call us or visit our website for more information. Thank you for joining us on this (virtual) factory tour! Next time why not visit us in person or contact our friendly and knowledgable customer service team?